First of all let me congratulate you for hosting such a great and simple site. Unlike any other site, i feel like reading when i opened this site. Now, my question is related to the changing of password. My computer is connected to a university LAN and i could like to change the password of the LAN connection. I asked about this in the helpdesk but they where not able to help me. May be they took my question so lightly. Do you have any idea about this. And I do have one more question Groove. Which software are you using to make your answers. It looks great. Especially the dialogue bubbles. Its easy to understand. Ok, should be a simple one however, I might need some additional information. For now I"ll go ahead and make some assumptions in order to answer your question. I'm "Hoping" that when you say "Change LAN Password", your talking about your local password on your machine. 1: Press - CTRL-ALT-DEL keys on the keyboard. To recap: On a Windows XP machine the easiest way to change your password is to login to your completed and press the CTRL+ALT+DEL button. This will cause XP to display a box with a few options on it. One of the options will say "Change Password". Just click that and it will prompt you to change your password. This process will change the password for an XP machine configured for a local workgroup AND configured in a Windows Active Directory Domain. That is of course if this is the password your trying to change? When you say "LAN Password" I assume that's the password your talking about? The primary WebSite is http://www.groovypost.com is running WordPress. I've done a LOT of customizations however the core is Wordpress. My Articles are written with Windows Live Writer and all my Screen Shots are taken using SnagIt. The Forum http://www.groovypost.com/forum is a customized version of PHPBB. Thank you for the comments regarding the site! I always love to receive feedback! Thanks for the reply Groove but that was not what i exactly need. 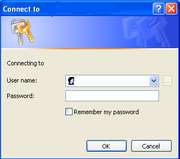 By doing the above step, i am able to change the password i used to login to the system. Now, let me try to explain my problem more clearly. After login into the system, my computer automatically connects to the network by the default login id and password. Now the some of the people here know my id and password(which is use to connect to network). So i would like to change that. As in the university we have to enter it when we navigate from one website to another. I dont know, whether i'm asking some silly things . Anyways thanks once again for your reply. And nice to know the details of your website. May god bless you. Form the information your giving me and from the screenshot, I still cannot tell what the University is using for their User Database. From the screenshot, I'm guessing it's not Windows. So with that in mind, unfortunately you will need to continue to work with your IT staff to find a way to change your PW. Hopefully they have a website which is fronting the account database which would allow you to change your PW. If it were windows and they had something like Outlook Web Access setup, you could use that to change your password. But again, they are probably using a *Nix type system. Thank you groove. Actually you gave me the confidence to ask my doubts to someone. Thank you so much. I will refinitly ask them about it. Hi Jas - groovydude has it right. sounds like you need to crack the whip on your IT guys at your univ. that's just crazy that they don't publish any way for you to change your PW. What university is it anyway? Hey, thats true.. I'm not going to leave them unless i solve it. And about the name of University.. I dont think its fair on my part to disclose it publically.. So we will just leave it..
That's probably a good idea No need to call anyone. What's important is that you get your password changed. If anything else comes up, please let us know.